Worthing Raiders were on the road again with a trip to Suffolk to play Bury St Edmunds, a team they had never beaten on their home ground. Selection for this game had been hampered by injury and unavailability. Tom Miller and Rob Cuffe made their debuts, Alex Basson made his first start after benching for the first time the previous week and Jordan Gibson was on the bench after missing more than a full season with injury. The pitch was in good condition and the weather was dry, cool and breezy. A good, open game was in prospect. Two minutes later Alex Basson had his first burst down the right wing, showing pace and the ability to beat defenders. The home side’s scrambling defence just did enough to prevent his run leading to a score. Within a couple of minutes the lead extended to 0-21 when Alex Basson sprinted fifty metres to touch down, after Liam Perkins had broken up the blind side from a scrum on Raiders’ twenty two metre line. Matt McLean again was successful with the kick. The home side used their powerful pack to good effect and soon earned a second try, this time converted to close the gap to 12-21. The coaches could hardly have asked for a better result from the first forty minutes. Jack Forrest restarted the game after half time and Raiders were on the attack straight away. Within three minutes they had a lineout ten metres from the Bury line, closely followed by a five metre scrum, unfortunately neither could be converted into points. After ten minutes Jack Lee received a yellow card and five minutes later Henry Birch joined him in the sin bin. The visitors having to play with only thirteen men defended manfully but eventually couldn’t prevent Bury from scoring their third try to close the gap to 17-26, after the conversion was missed. It looked as if the big, Bury forwards might turn the game around in the latter stages but it was the visitors who took control of the game in the last fifteen minutes with plenty of exciting and skilful interplay. With fifteen minutes left to play Raiders were back to their full complement of fifteen players. Confidence continued to grow and was evident in the way they played. The scoring for Raiders was completed after a typical Kiba Richards break in the centre of the pitch saw him free his arms in the tackle and offload to Ben Holt, his pass to John Dawe was perfectly timed and no one was going to stop John from twenty metres out. 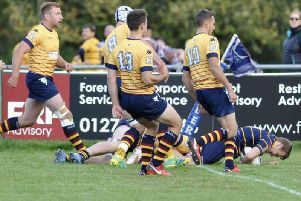 Although the conversion was missed at 17-36 and ten minutes to play the win looked secure. Bury still felt they could gain a losing bonus point and when, with eight minutes to go, John Dawe was yellow carded they made the extra man count and scored a try under the posts. The conversion was missed. The gap closed to 22-36. Raiders held their nerve and played out the last five minutes in control of the ball. When time ran out they still had possession and were able to kick the ball out of play to end the game. 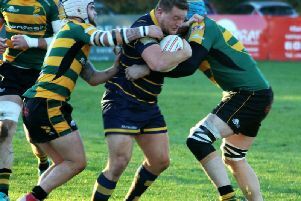 Raiders’ defence had been excellent throughout the game and even though they were under pressure in the scrum they had created plenty of chances and scored six tries. It was pleasing to see how well the new players had settled into the side and made valuable contributions in this important away win. For Raiders’ supporters and players alike a bonus point win made the long journey well worthwhile.